Theatrical poster by John Alvin. Rain Man is a 1988 American road comedy-drama film directed by Barry Levinson and written by Barry Morrow and Ronald Bass. It tells the story of an abrasive and selfish young wheeler-dealer, Charlie Babbitt (Tom Cruise), who discovers that his estranged father has died and bequeathed all of his multimillion-dollar estate to his other son, Raymond (Dustin Hoffman), an autistic savant, of whose existence Charlie was unaware. Charlie is left with only his father's car and his collection of rose bushes. In addition to the two leads, Valeria Golino stars as Charlie's girlfriend, Susanna. Morrow created the character of Raymond after meeting Kim Peek, a real-life savant; his characterization was based on both Peek and Bill Sackter, a good friend of Morrow who was the subject of Bill, an earlier film that Morrow wrote. Rain Man received overwhelmingly positive reviews, praising Hoffman's role and the wit and sophistication of the screenplay, and was the highest-grossing film of 1988. The film won four Oscars at the 61st Academy Awards (March 1989), including Best Picture, Best Original Screenplay, Best Director, and Best Actor in a Leading Role for Hoffman. Its crew received an additional four nominations. The film also won the Golden Bear at the 39th Berlin International Film Festival. When Charlie learns that his estranged father has died, he and his girlfriend Susanna travel to Cincinnati, Ohio in order to settle the estate. He learns he is receiving the 1949 Buick Roadmaster convertible over which he and his father fought and his father's rose bushes, but the bulk of the $3 million estate is going to an unnamed trustee. Through social engineering, he learns the money is being directed to a mental institution, which he visits and where he meets his older brother, Raymond, of whose existence he was previously unaware. Raymond has autism and adheres to strict routines, such as always watching The People's Court, to which he refers as "Wapner" after the judge who presides over the show. He has superb recall, but he shows little emotional expression except when in distress. Charlie spirits Raymond out of the mental institution and into a hotel for the night. Susanna becomes upset with the way Charlie treats his brother and leaves. Charlie asks Raymond's doctor for half the estate in exchange for Raymond's return, but he refuses. Charlie decides to attempt to gain custody of his brother in order to get control of the money. After Raymond refuses to fly to Los Angeles, because he remembers every airline crash and is worried about getting hurt, they set out on a cross-country road trip together. During the course of the journey, Charlie learns more about Raymond, including that he is a mental calculator with the ability to instantly count hundreds of objects at once, and make nearly instant calculations on the exponential level, far beyond the normal range for humans. Unfortunately, they make slow progress on their trip because Raymond insists on sticking to his routines, which include watching "Wapner" on television every day and getting to bed by 11:00 PM. He also objects to traveling on the interstate after they pass a bad accident. Charlie also learns that, like him, Raymond loves The Beatles. One night while staying in a hotel, Charlie begins to draw a bath, and Raymond has a breakdown, screaming and desperately attempting to shut off the water, and incoherently yelling about "hot water, burned baby." It is revealed that Raymond actually lived with the family when Charlie was young, and Charlie realizes that the comforting figure from his childhood, whom he falsely remembered as an imaginary friend named "Rain Man", was actually Raymond, who was sent away because he had accidentally severely burned Charlie with scalding hot water in the bathtub as a little boy. After the Lamborghinis are seized by his creditor, Charlie finds himself $80,000 in debt and hatches a plan to return to Las Vegas, which they passed the night before, and win money at blackjack by counting cards. Though the casino bosses are skeptical that anyone can count cards with a six deck shoe, and after reviewing security footage, they ask Charlie and Raymond to leave. However, the casino bosses allow Charlie to keep the money. Also, Charlie has made enough to cover his debts and has reconciled with Susanna who rejoined them in Las Vegas. One morning, while Charlie is still sleeping, Raymond attempts to cook breakfast by putting frozen waffles in the toaster. He becomes distracted, though, and the toaster burns the waffles to the point of setting off the smoke detector, which sends Raymond into a panic. Charlie wakes up and is able to detach the smoke detector, but Raymond continues to bang his head against the door in his panicked state. Even after calming him down, Charlie resolves to seek more psychiatric help for Raymond. Back in Los Angeles, Charlie meets with Dr. Bruner, who offers him $250,000 to walk away from Raymond forever. Charlie refuses and says that he is no longer upset about what his father left him, but he wants to have a relationship with his brother. At a meeting with court-appointed psychiatrist Dr. Marston (Levinson, in an uncredited cameo), Raymond is shown to be unable to decide for himself what he wants. Charlie stops the questioning and tells Raymond he is happy to have him as his brother. In the final scene, Charlie brings Raymond to the train station where he boards an Amtrak train with Dr. Bruner to return to the mental institution. Charlie promises Raymond that he will visit in two weeks. 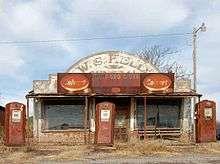 A now-abandoned gas station and general store in Cogar, Oklahoma was used in a scene from the film. Roger Birnbaum was the first studio executive to give the film a green light; he did so immediately after Barry Morrow pitched the story. Birnbaum received "special thanks" in the film's credits. Agents at CAA sent the script to Hoffman and Bill Murray, envisioning Murray in the title role and Hoffman in the role eventually portrayed by Cruise. Martin Brest, Steven Spielberg, and Sydney Pollack were directors also involved in the film. Mickey Rourke was also offered a role but he turned it down. Almost all of the principal photography occurred during the 1988 Writers Guild of America strike; one key scene that was affected by the lack of writers was the film's final scene. Bass delivered his last rough cut of the script only hours before the strike started and spent no time on the set. Rain Man received mostly positive reviews from critics, with Hoffman's performance being universally praised. The film currently has a "certified fresh" score of 90% on Rotten Tomatoes with an average rating of 7.9 out of 10. The critical consensus states "This road-trip movie about an autistic savant and his callow brother is far from seamless, but Barry Levinson's direction is impressive, and strong performances from Tom Cruise and Dustin Hoffman add to its appeal." Vincent Canby of The New York Times called Rain Man a "becomingly modest, decently thought-out, sometimes funny film"; Hoffman's performance was a "display of sustained virtuosity . . . [which] makes no lasting connections with the emotions. Its end effect depends largely on one's susceptibility to the sight of an actor acting nonstop and extremely well, but to no particularly urgent dramatic purpose." Canby considered the "film's true central character" to be "the confused, economically and emotionally desperate Charlie, beautifully played by Mr. Cruise." Amy Dawes of Variety wrote that "one of the year's most intriguing film premises ... is given uneven, slightly off-target treatment"; she called the road scenes "hastily, loosely written, with much extraneous screen time," but admired the last third of the film, calling it a depiction of "two very isolated beings" who "discover a common history and deep attachment." One of the film's harshest reviews came from New Yorker magazine critic Pauline Kael: "Everything in this movie is fudged ever so humanistically, in a perfunctory, low-pressure way. And the picture has its effectiveness: people are crying at it. Of course they're crying at it – it's a piece of wet kitsch." Roger Ebert gave the film three and a half stars out of four. Rain Man debuted on December 16, 1988, and was the second highest-grossing film at the weekend box office (behind Twins), with $7 million. It reached the first spot on the December 30 – January 2 weekend, finishing 1988 with $42 million. The film would end up as the highest-grossing U.S. film of 1988 by earning over $172 million. The film grossed over $354 million worldwide. Rain Man won Academy Awards for Best Picture; Best Actor in a Leading Role (Dustin Hoffman); Best Director; and Best Writing, Original Screenplay. It was nominated for Best Art Direction-Set Decoration (Ida Random, Linda DeScenna); Best Cinematography (John Seale); Best Film Editing; and Best Music, Original Score (Hans Zimmer). The film was nominated for twenty-four other ceremonies, including the Golden Globes, in which it won Best Motion Picture in the drama genre and Best Actor (Dustin Hoffman), and was nominated for Best Director (Barry Levinson) and Best Screenplay (Ronald Bass and Barry Morrow). Valeria Golino received a nomination for Best Supporting Actress at the Silver Ribbon Awards. Rain Man's portrayal of the main character's condition has been seen as inaugurating a common but mistaken media stereotype that people on the autism spectrum typically have savant skills, and references to Rain Man, in particular Dustin Hoffman's performance, have become a popular shorthand for autism and savantism. 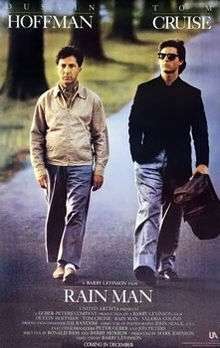 Conversely, Rain Man has also been seen as dispelling a number of other misconceptions about autism, and improving public awareness of the failure of many agencies to accommodate autistic people and make use of the abilities they do have, regardless of whether they have savant skills or not. The film is also known for popularizing the misconception that card counting is illegal in the United States. During June 1989, at least fifteen major airlines exhibited only in-flight movie versions of Rain Man that cut a scene about Raymond's refusal to fly, except for Australia-based Qantas. Those criticizing this move included film director Barry Levinson, co-screenwriter Ronald Bass, and George Kirgo (at the time the President of the Writers Guild of America, West). "I think it's a key scene to the entire movie," Levinson said in a telephone interview. "That's why it's in there. It launches their entire odyssey across country – because they couldn't fly." While some of those airlines cited as justification avoiding having airplane passengers feel uncomfortable in sympathy with Raymond during the in-flight entertainment, the scene was shown intact on flights of Qantas, and commentators noted that Raymond mentions it as the only airline whose planes have "never crashed". The film is in fact credited with introducing Qantas to U.S. consumers. 1 2 3 Barry Morrow's audio commentary for Rain Man from the DVD release. ↑ "Berlinale: 1989 Prize Winners". berlinale.de. Retrieved March 13, 2011. 1 2 Bass' audio commentary for Rain Man from the DVD release. ↑ "Mickey Rourke: a life in film". Time Out. Retrieved 10 September 2015. ↑ "Rain Man (1988)". Rotten Tomatoes. Retrieved July 4, 2010. ↑ "Weekend Box Office: December 16–18, 1988". Box Office Mojo. ↑ "Weekend Box Office: December 30 – January 2, 1988". Box Office Mojo. ↑ "The 61st Academy Awards (1989) Nominees and Winners". oscars.org. Retrieved July 31, 2011. ↑ Treffert, Darold. "Rain Man, the Movie/Rain Man, Real Life". ↑ Rose, I. Nelson; Loeb, Robert A. (1999). Blackjack and the Law. Rge Pub. ISBN 978-0-910575-08-9. ↑ "Airlines Cut Scene From 'Rain Man'". The New York Times. June 29, 1989. Retrieved June 6, 2015. ↑ Weinstein, Steve (June 29, 1989). "Uneasy Airlines Get Final Cut on 'Rain Man'". Los Angeles Times. Retrieved June 6, 2015. ↑ Kamenev, Marina (November 24, 2010). "Qantas: Airline Safety's Golden Child No More?". Time. Retrieved June 6, 2015. ↑ "Is Qantas still the world's safest airline?". News.com.au. January 7, 2014. Retrieved June 6, 2015.